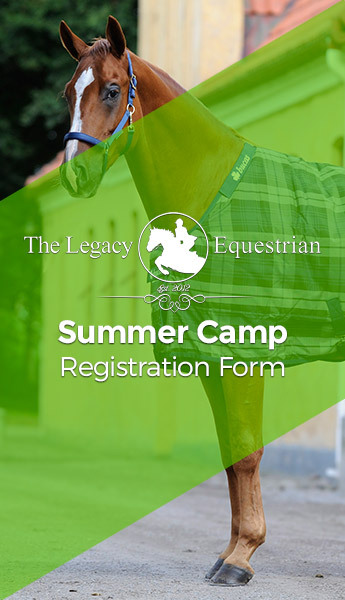 Legacy Equestrian Center is an ideal place for children to spend time in the summer and an outdoors, educational and safe environment with trained professionals. Our day camp program is designed to nurture respect and appreciation for horses through hands-on activities and riding lessons. Children ages 5 and up, and all skill levels, are welcome. Campers learn Hunt Seat Riding, Horse Care, Basic Barn First Aid, Grooming, Barn Chores, Crafts and Much More! Camp is open to any beginner to intermediate rider. Campers will be placed in groups based upon sill level. All campers are required to wear long pants or jeans and boots. Helmets will be provided if you do not own one. USEF Rules and Regulations are followed, therefore bicycle helmets are not allowed. Campers must bring their own lunch and plenty of water. All half day camps run from 9:00am – 1:00pm. A $50 non-refundable deposit is required with the application and release forms (Download Registration Form). The remainder is due on the first day of selected session.